Delivery time on the new motor was about a week, which cost us time, as did the break for Thanksgiving. But beyond these reasons specific to our case lie more general reasons applying to all boats. First, every boat is unique. Even boats of the same make and model - even new boats - even consecutive hull numbers - can have big differences. With older boats, add a decade or two and a few owners, each adding stuff, subtracting stuff, rerouting hoses, rewiring things, changing out parts, etc, and each boat becomes unique. 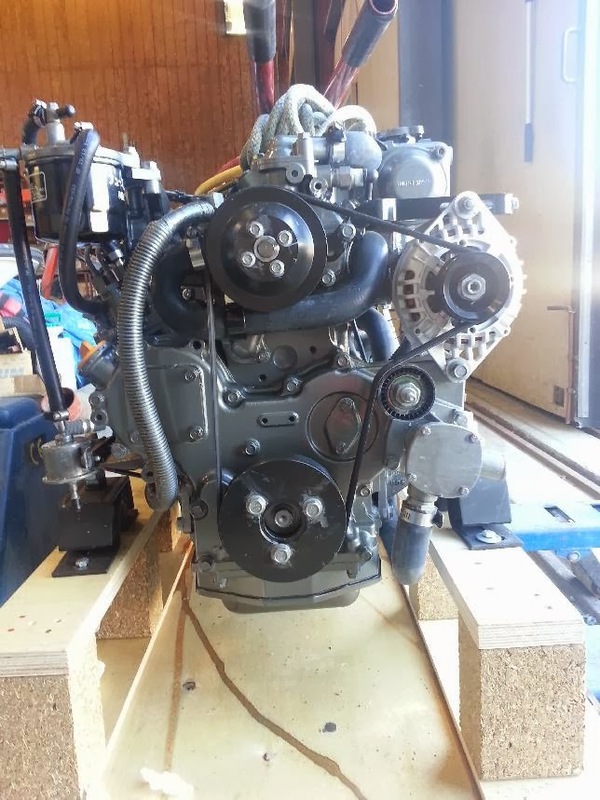 Each motor installation is a custom job, and those craftsman who work in boatyards must be full of ingenuity. There is almost always something to custom-fabricate. In our case for example, despite the fact that the new motor was the closest possible replacement for the old, the mounts differed, requiring us to salvage one mount from the old engine and make another mount from scratch. Another reason is the sub-optimal layout of our engine room. (Ha ha! Just kidding. We have no engine room. In small and mid-sized boats, motors are always located in tight, difficult to access places. Just about everything that happens requires some kind of contortionist position that would be considered torture if it were forced on you by someone else. 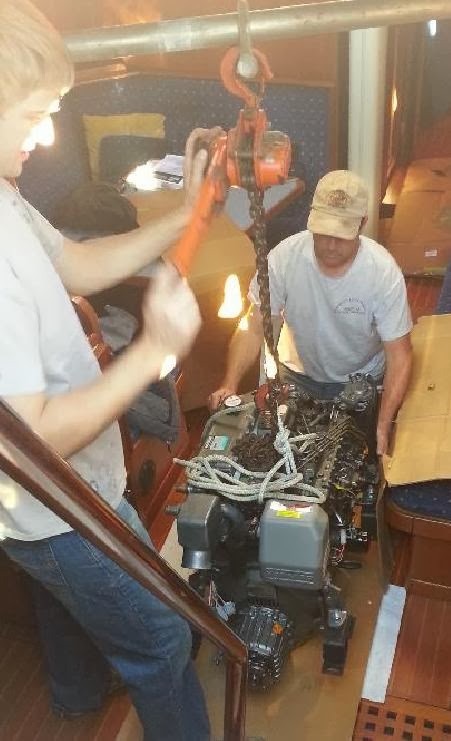 In our case, the motor is below the floor of the cabin, so almost all work involves bending down or hanging down or crouching over or laying on the motor with something sharp poking into you. And any part or tool that gets dropped stands a better than average chance of falling below the engine in a difficult to reach place. 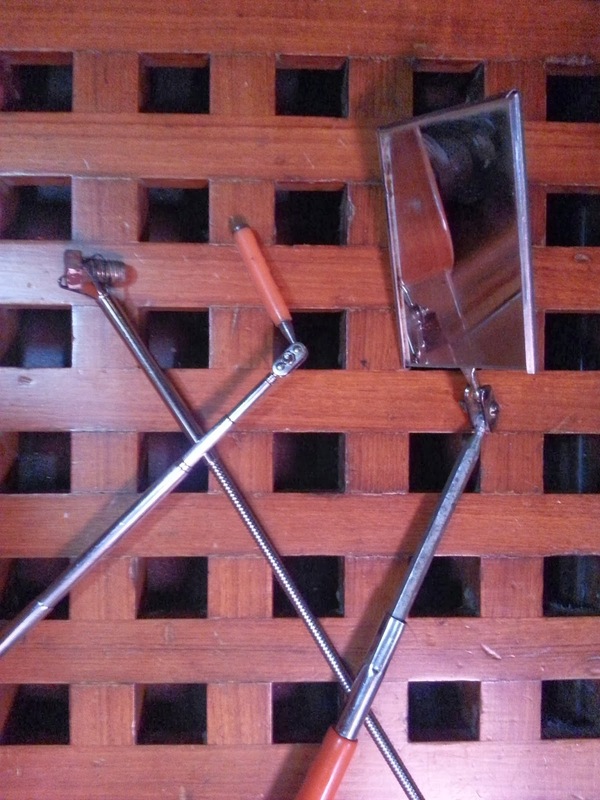 Crucial tools for any engine work include a magnetic retriever and a mirror, each on a telescoping rod, and also a mechanical snatcher (as shown at top). water through an opening in the hull and (hopefully) sending that water back out again along with the motor exhaust. Everything has to be done right. For example any hose below the waterline has to be double clamped. (A hose coming off can flood the boat very quickly). Another example is that our propeller shaft needed to be aligned to .004". Unfortunately, the old shaft did not fit the new motor. We could have had a propeller shaft extension made, but a better way to do things is to make a new propeller shaft, so we did. 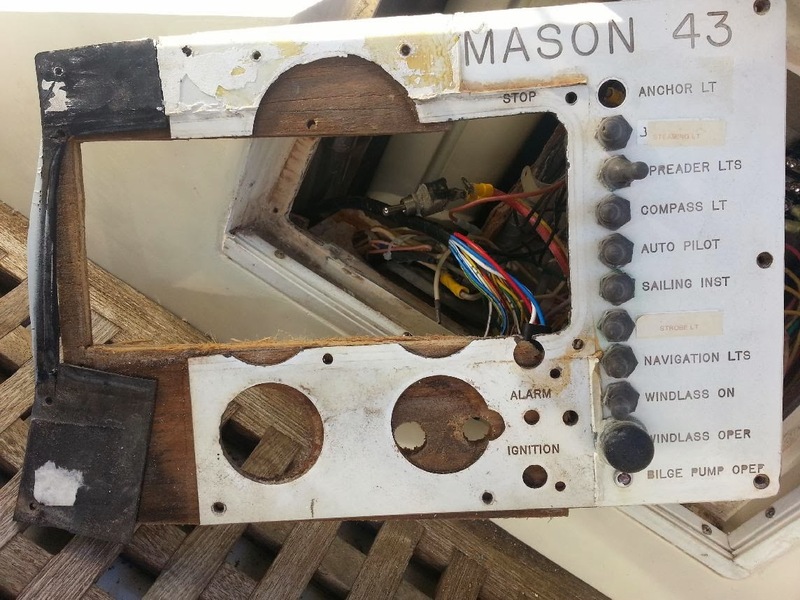 This required hauling out the boat to properly measure the shaft length (by destructively removing it). 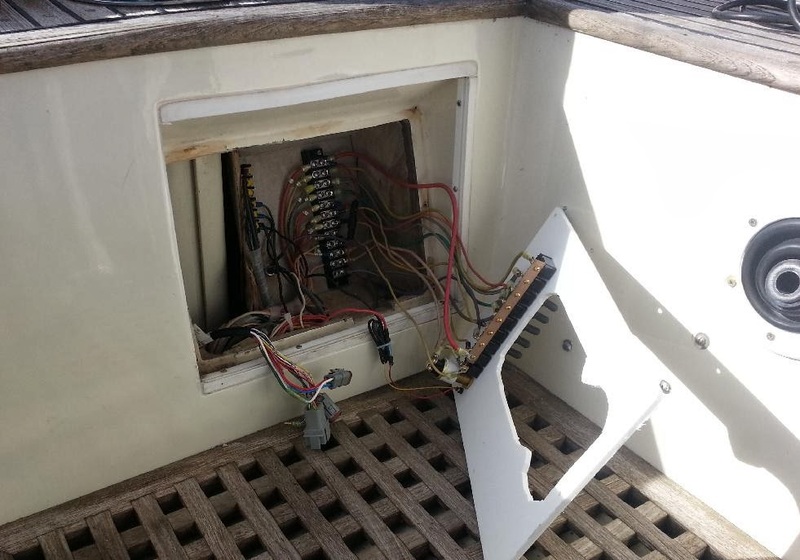 Then, since we were living aboard, a temporary plug was made for the shaft hole and the boat was put back in the water. Then - three trips (driving) to the machinist in Morehead City. Then the boat was hauled again to install the new shaft. Another example: before turning us loose with our new motor, our mechanics needed to conduct a sea trial - but only after the motor had 10-20 hours of run-time under high load (in other words, not just idling). Ideally we would have taken boat out and just driven around the Neuse River. However, the winds were out of the south for days, and around Oriental, this literally blows the water north, dropping the water level one foot or more. We would have run solidly aground trying to get out. Eventually we resorted to tying extra lines to the dock and motoring in place (see video). In the software development world, it's common practice to multiply time estimates for large projects by two. Or more. Sometimes this happens more than once up the management chain. While this may seem sloppy, it is one way to address the fact that the act of developing software is also a process of discovery. Next time I'm multiplying by two. At least. 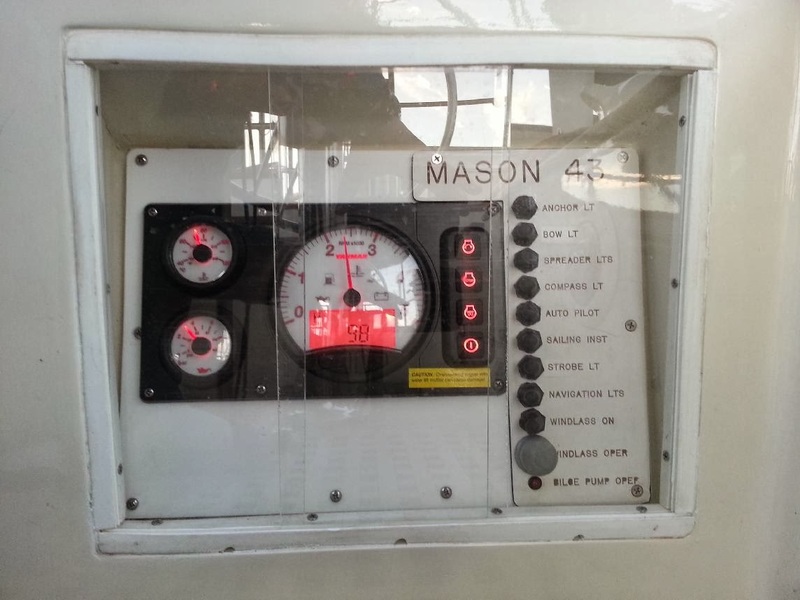 For you other sailors and Mason 43 owners reading this, here are more engine details. What we removed was a Yanmar 4JH3E. 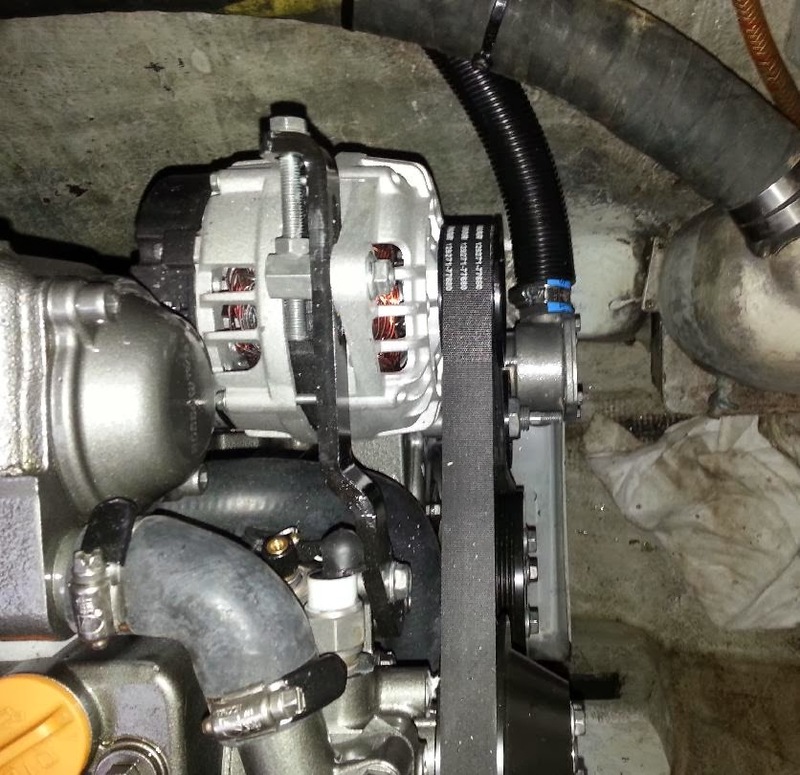 We replaced it with the current version of the same motor, the 4JH5E. These are both naturally aspirated diesels. The new uses the same block as the old, but Yanmar has made many small improvements,. The raw water pump is in the same location but now faces forward so that you can actually see it when changing the impeller. The high-output alternator uses a serpentine belt and has a great tension adjustment system. The old motor maxed at 3600 RPM and put out 56HP. The new is designed to max at 3000 RPM with 53 HP. It gives us plenty of power and will do even better once we tweak the adjustment of the feathering propeller. The motor mounts changed with the new version. The forward ones are very close to the same, but Yanmar made the rear ones wider so that they would be the same width as the forward ones. We used the rear mounts from the old engine after bead-blasting and repainting them. 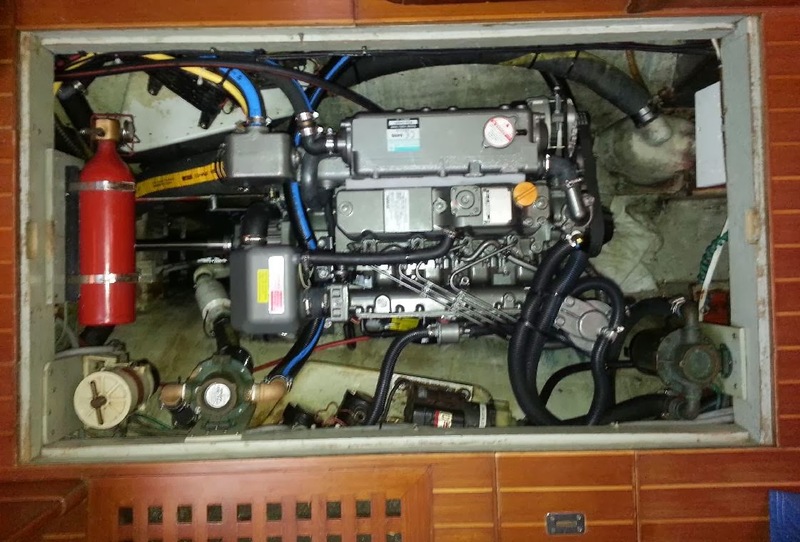 Deaton Yacht Service in Oriental did the work on our motor, and a fine job they did. I also took this opportunity to rewire and rebuild the instrument panel in the cockpit. The old had many layers of mods and was not in good shape. I did save as much of the original panel as possible.